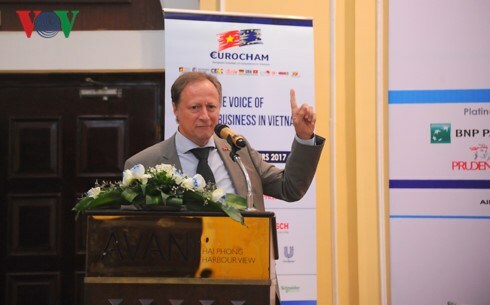 Hai Phong (VNA) – The European Chamber of Commerce in Vietnam (EuroCham) opened a new chapter in the northern port city of Hai Phong last week. This is EuroCham’s second regional branch after a chapter was launched in central Vietnam last November. Representatives of EuroCham also participated in the ground-breaking ceremony of the Deep C Industrial Zones and toured the new industrial facilities around Hai Phong, most notably Lach Huyen Port and Tan Vu Bridge. They also met with business leaders, local authorities and European diplomatic representatives to discuss the potential of the northeastern region of Vietnam as a prime investment destination. Experts and officials discussed local investment practices, tax incentives, talent management, real estate development and new infrastructure projects, providing a unique opportunity to hear from experts and government representatives about the current business potential of Hai Phong and northeastern Vietnam.